God can see you, Stalin can’t! 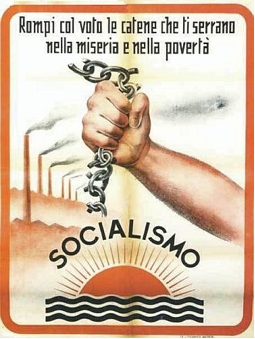 Whenever the rhetoric escalates – as it always does, sooner or later – I’m reminded not just of a particular election but of a particular campaign poster. This one. 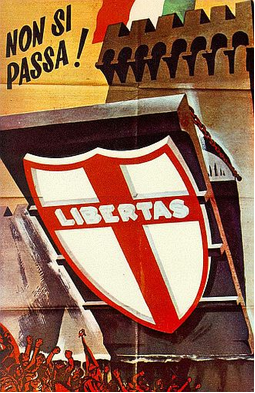 The Italian election of 1948 – the first of the neonate Republic ­– was fought not through mass media but in the squares, from the pulpits, in the factories. 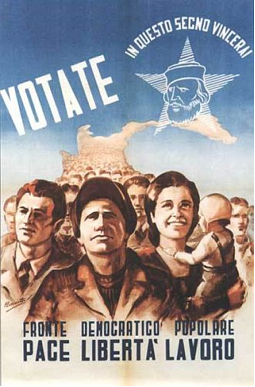 Its main vehicle of party-political propaganda was the poster. Millions of them were printed and distributed, and some specimens have become justly famous. 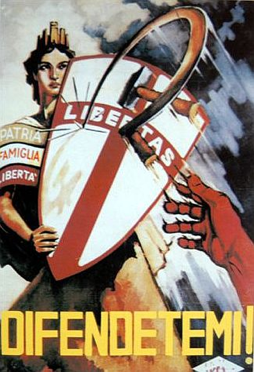 None more so than the one above, in which the secular allegorical personification of Italy (Italia turrita – we met it before), sporting the banners of Country, Family and Liberty, protected Herself with the shield of the Christian Democrats against a cowardly attack by the red hand of the Communists. 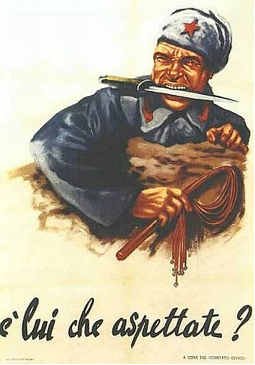 Underneath, the slogan: DEFEND ME! You can’t get a lot more existential than this: a fight not only around radically different conceptions of the state, the economy and society, but the very soul of the citizen. God can see you. You must do the right thing. 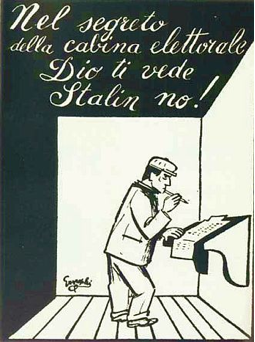 Stalin can’t. Remember who has the power here. It would, however, be misguided to express nostalgia for the stark character of that confrontation. 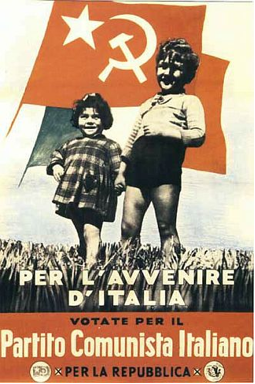 Whatever noble and genuine ideological differences animated people on both sides, what was playing out in Italy in the weeks leading up to 18 April 1948 was actually the beginning of the Cold War. And as a war – an actual war – it was represented. Vote, or he will be your master. 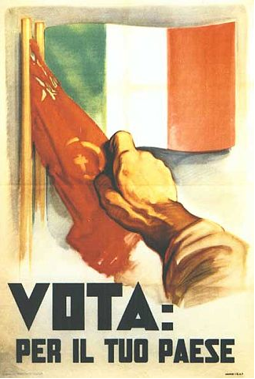 Defend your town, and you’re defending Italy! 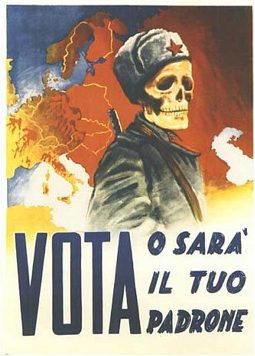 Vote: for the sake of your country! Is he the one you’re waiting for? 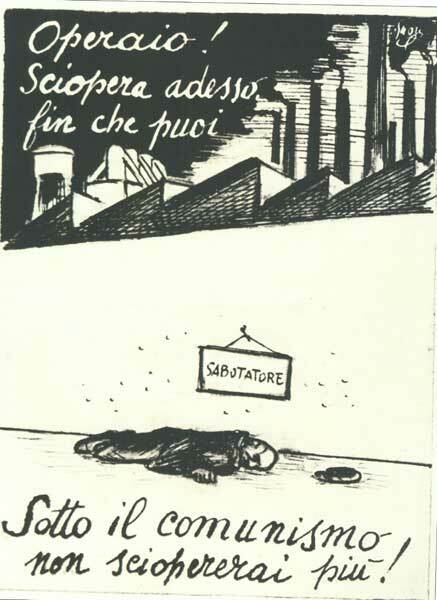 From another idea of Guareschi’s came this brilliant representation of the Communist threat. 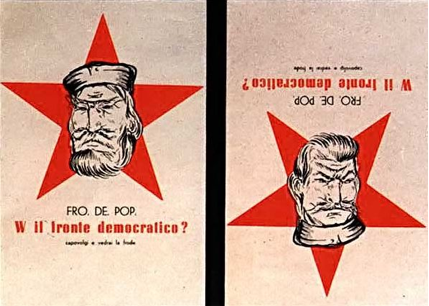 Just as cleverly, a card allowed the voter to reveal the sinister features of Stalin lurking in the noble visage of the revolutionary hero Garibaldi (the symbol of the Popular Democratic Front, under whose banner the Communists and the Socialists ran together). 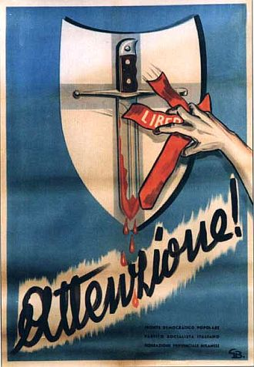 The Christian Democrats weren’t above presenting themselves as the administrators and guarantors of the much needed aid and reconstruction funds provided for under the Marshall Plan. 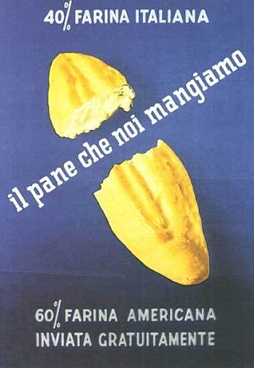 And in those immediate post-war years, ridden with sudden and catastrophic increases in the cost of living, what could be more essential, more basic than bread? 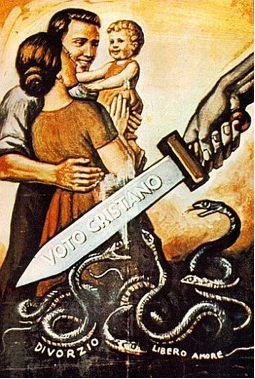 The sword of the Christian Vote vanquishes the serpents of divorce and free love. 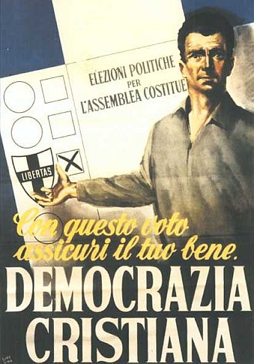 To find a hopeful, non-threatening poster we must look at the election for the Constitutional Assembly held two years earlier, in which a good man in the popular style of one of those ‘thanks for the grace received’ paintings demonstrated how to cast a good vote. It’s doubtful that it was those posters that won the campaign. 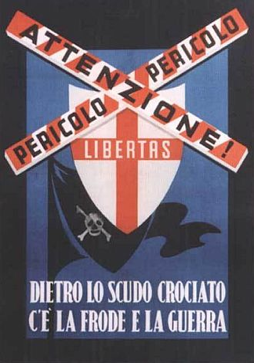 What they do show, however, is that the Christian Democrats were supremely comfortable with making the election a question of under whose sphere of influence Italy should place itself. And not just because that choice had already been made, amongst the great powers, but also because the draw of the American promise was greater. Theirs was the army that had liberated us. Theirs were the food and the resources that staved off the general misery of a country impoverished by twenty years of fascism and devastated by war. Theirs was the side on which the Church stood, with its power to reach – like the posters themselves – a population that still suffered from staggering rates of illiteracy. If it was a referendum, either with America or with the Soviet Union, the Left was going to lose. Their timid posters reflected this, as they pointed to a danger that was not clear but hidden, murky. Behind the shield with the cross, a bloody dagger. Behind the shield with the cross, deceit and war. These, to be quite clear, were parties that at this time read diligently from the instruction sheets of the Cominform. It was no slander to call them Stalinist. But the aspiration to a different life of the vast majority of their members, that was real, and expressed itself into a language and in a tense that I recognise from my own childhood, a quarter of a century later, when the Left could still look with hope, even confidence, to the future. That was our most important election, of which remain but these images. Not revolution but civil war was a very concrete possibility. Another war, between two powers far greater than ours, was being fought within out borders, through symbols such as these. It would be far too naïve to presume that we really had a say in the matter. Fascinating. In the context of the Australian election, it seems almost unimaginable that two parliamentary parties could campaign with such rhteoric. On a completely different note, something else that jumped out at me was the weird echo of high Stalinism, when, in the Soviet Union at least, the propaganda specifically stressed that notion that ‘Stalin’ (or representatives of Stalin) could in fact see you at all times and there was no place, particularly not the ballot box, where you could escape him. When you put it like that it’s almost a shame that Garibaldi didn’t have such powers. I’m curious about the slogan ‘In Questo Segno Vincerai’ … it sounds very similar to the message that appeared to Constantine on the eve of battle, that moved him (and through him, eventually, the Roman Empire & finally Europe) to convert to Christianity. Supposedly, he saw a crucifix in the sky and the words ‘In Hoc Signo Vinces’. Is this a deliberate allusion? I wondered the same thing. I think the reference has to be to the Latin phrase because it’s a very awkward expression in Italian, but the figure of Constantine is in many respects anathema to the Risorgimento and Garibaldi. Perhaps they wanted to reclaim the phrase, as if to say, this (and not the cross) is the sign in which you shall prevail. Really interesting. 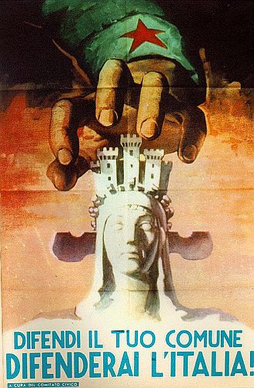 Guareschi’s ‘God can see you’ poster could have been lifted straight out of a Don Camillo story. Guaranteed to make Peppone blow his top. I think they used the slogan in one of the Don Camillo films, in fact, although I’m not absolutely certain. 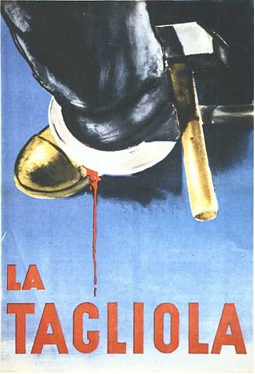 Some of his other posters were decidedly less inclined to bonhomie and respect for the adversary than in the Don Camillo stories, however, it must be said. 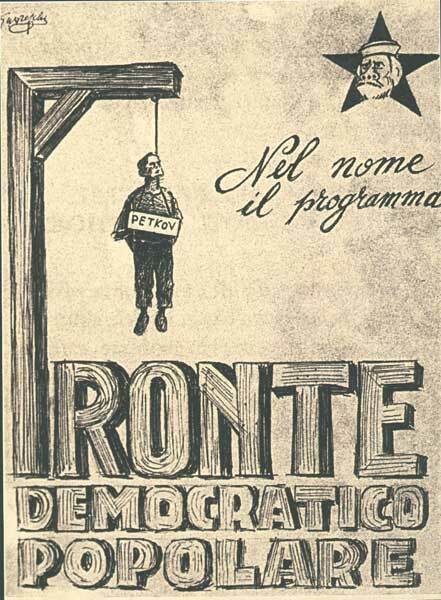 There was the one that warned workers to strike now while they could, as under the Communists they would be declared saboteurs and killed, or the other one in which the F of Democratic Popular Front became a gallows – ‘as in word, so in deed’ – and Garibaldi appeared in the corner drawn with three nostrils, as per Guareschi’s ferocious caricature of the Communists (the third nostril was there to allow the brain to drip out, and to introduce instructions from the Cominform). There are Don Camillo FILMS??? Of course. DVDs. Wouldn’t dream of obtaining movies in any other way. 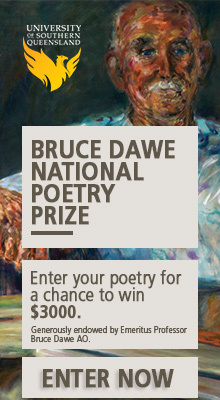 And I always imagine you must have an awesome collection of fascist posters and right-wing literature in your house. Thanks for another unique and intriguing post. DVDs may be the only way to obtain the films with English subtitles. If you speak French, YouTube’s your oyster. This battle between Church (as family) and any sort of modern State sorta suggests Italy has never gotten beyond feudalism, right? The 1948 election preceded the post-war agrarian reforms, so feudal relations would have been still prevalent in vast areas of the country. My mother grew up in the supposedly more modern north but witnessed many examples, of which perhaps the most striking is this: essential to the lives of farm labouring families was what little communal time they could organise for themselves in the evenings – what was known locally as the filò – but in the longer and colder winter nights they often couldn’t afford the warm up a room for it. So they gathered in the barn with the cattle. And for this privilege – for using up heat produced by animals that didn’t belong to them – the landowners charged them a certain amount of working days. I believe it – but unbelievable! Fascinating post. I wish there were any poster designs worth salvaging from the current federal election, but the ones I’ve seen thus far have been instantly forgettable.